The first full endorsement of the Hollow Earth idea came in April 1942 in the middle of the European struggles for control of the western world. At the height of the conflict, when the Third Reich was placing maximum effort into driving off the advancing allies, Goering Himmler and Adolf Hitler enthusiastically launched an expedition to the island of Rugen. The expedition party consisted of many of Germany's finest scientists who were tasked with locating the race of demi-gods who lived inside the globe and convincing them to help the Nazi party eliminate the allied armies. In Hitler's instructions, the group would easily gain the cooperation of the hidden lords of the underworld once they illustrated the Germans as the divine race who most deserved dominance on the surface. Hitler and Himmler both felt it vital to contact the inner race before the allies who would eventually find the inner world as well. In April, 1942, Nazi Germany sent out an expedition composed of its most visionary scientists to seek a military vantage point in the "Hollow Earth." Although the safari of leading scientists left at a time when the Third Reich was putting maximum effort in their drive against the Allies, Goering, Himmler, and Hitler enthusiastically endorsed the project. The Fuehrer had long been convinced that Earth was concave and that man lived on the inside of the globe. 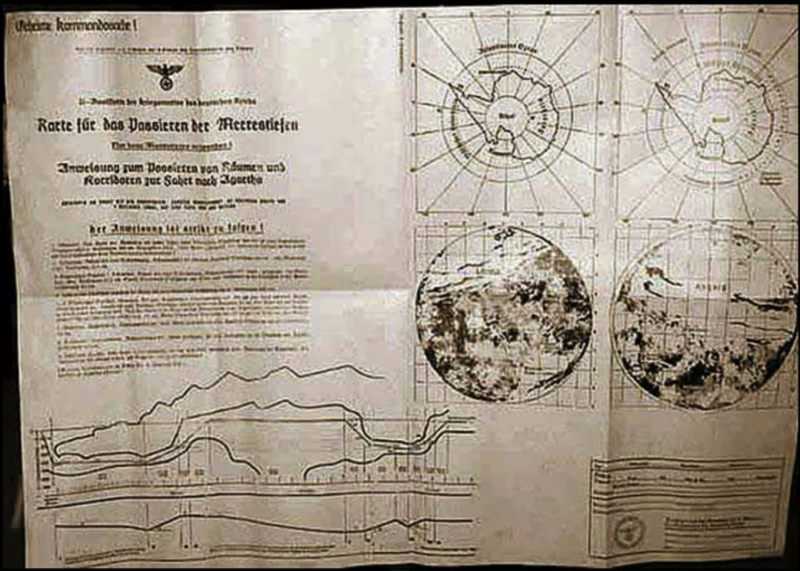 According to theory advanced by the Nazi scientists, if the Third Reich were to position their most astute radar experts in the proper geometric area, they would be able to determine the position of the British Fleet and the Allied bomber squadrons, because the concave curvature of the globe would enable infrared rays to accomplish long-distance monitoring. When the Nazi exponents of the Hollow Earth hypothesis sent the expedition to the island of Rugen, they had complete confidence in their pseudo-scientific vision. Those nearest the Fuehrer shared his belief that such a coup as discovering the entrance to the Inner World would convince the Masters who lived there that the Nazis were truly deserving of mixing their blood in the hybridization of a master race. An important element in the Nazi mythos was the belief that representatives of a powerful, underground secret race emerged from time to time to walk among Homo sapiens. Hitler's frenzied desire to breed a select race of Nordic types was inspired by his obsessive hope that it should be the Germanic peoples who would be chosen above all other humans to interbreed with the subterranean supermen in the mutation of a new race of heroes, demigods, and god men. Thanks! And I was thinking the same thing, it's been a while since he's been around. But I appreciate the compliment! !